A relatively new paradigm in the treatment of addiction to opiates has come into vogue known as Medication-Assisted Treatment (M.A.T.). 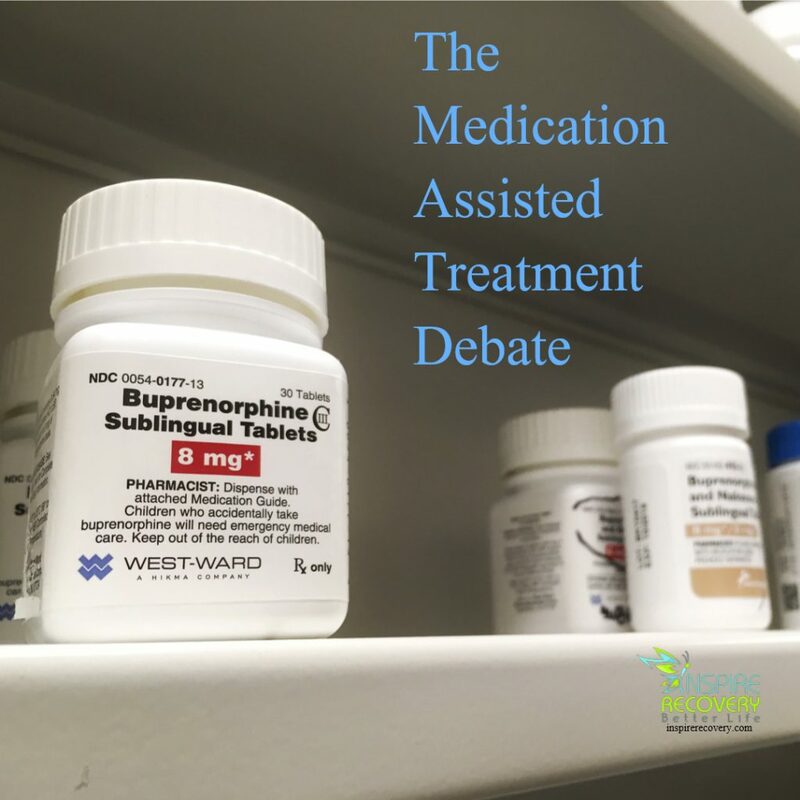 This form of treatment typically hinges on the prescription of a medication called Suboxone. Suboxone is a combination of the drugs buprenorphine, an opioid itself, and naloxone, a drug that, among other things, can block the euphoric high associated with opioids. This combination satisfies the physical craving for opiates, therefore deterring patients prescribed to it from taking street drugs to get high. M.A.T. is a subject of controversy among addiction treatment professionals. More often than not M.A.T. means long-term Suboxone maintenance, which is not dissimilar from methadone maintenance, a much older form of M.A.T. “Maintenance,” in this sense refers to a means of remaining abstinent from addictive opiates like heroin and prescription opioid painkillers by continually taking Suboxone. The main argument for long-term Suboxone maintenance is one of “harm reduction.” The stance is grounded in the idea that opiate addicts are generally unable to recover from their addiction. That being the case, keeping them on a prescribed Suboxone regiment will help them stay away from more dangerous drugs they’d be more likely to overdose on in the event of a relapse. Some physicians and treatment professionals advocate for a short-term Suboxone treatment model. In this model, Suboxone is used to stabilize addicts in early recovery by avoiding the harsh withdrawal effects associated with opiates. After a short period of time, they can be tapered off Suboxone until they are opiate free. Others believe long-term treatment with Suboxone is more effective. Statistically, people who remain on Suboxone for longer periods of time are less likely to relapse on heroin or prescription opioids. The trump card in the case for long-term Suboxone maintenance is that the number of deaths from overdoses can be cut nearly in half with recovering addicts who participate in Medication Assisted Treatment. This means a lot in the atmosphere of the nationwide deadly opioid addiction epidemic. Exactly how long is “long-term?” How long is long enough? How long is too long? It’s difficult to make a blanket statement and the answers to those questions most likely depend on individual case considerations, but it’s disconcerting that some people remain on Suboxone for periods of time longer than ten years in this practice of treating opiate addiction with another opiate. Anecdotal evidence suggests that Suboxone can, in fact, be abused. It can be used to get high if injected, snorted or used in such a way that buprenorphine can be separated from the opioid receptor antagonist, naloxone. Also, Suboxone is often used as a way to simply stave off withdrawal symptoms before addicts can return to using their drug of choice. For people who are not addicted or accustomed to taking opiates, using Suboxone results in an intense high (and it can be a risk for fatal overdose). For these reasons, Suboxone has begun to be trafficked illegally on the street. The emergence of Cash-Only Suboxone Clinics raises red flags because of the close similarity to the problem of the so-called “pill mill” pain clinics, where opioid pain medications became exceedingly over-prescribed, contributing in a big way to the now nationwide addiction epidemic. Combatants of Suboxone maintenance are wary that Suboxone is being over-prescribed in the same way. By and by, Suboxone is still an addictive substance and there are fortunes of wealth to be made for providers and manufacturers in peddling an addictive drug. After long-term use, if someone decides they want to come off of Suboxone, the withdrawal period is longer and a markedly worse experience than it is with other opiates. It can last for months. Furthermore, research studies on potential negative health consequences related to long-term Suboxone maintenance are non-existent. There’s no certainty what the long-term effects could be. Many believe that Suboxone maintenance doesn’t effectively treat the true nature of addiction, which is largely psychological. Regularly taking Suboxone can temporarily alleviate emotional pain, depression and anxiety, but the root causes of those afflictions are left untouched. In this way, Suboxone maintenance is like keeping a band-aid on an infected wound. Further harm may be kept at bay, but the real problem is left to fester just underneath the surface.